One never really knows where life might lead them. We can make our plans, and things can look pretty predictable for a while, maybe even a very long time, but one never knows when circumstances might lead them in a totally different direction then they ever thought they might end up going in. …a reason you can’t start a business or any other new venture. …a valid excuse for inaction. …a valid excuse to give up on your dreams. Truth is . . . nobody really knows what tomorrow holds whether you’re 8 or 80 or older. As the saying goes, life could “turn on a dime” tomorrow. And our journey could take us to the most unexpected places, no matter how old we may be. I can’t even explain how many people think that their dreams have passed then by. That it is too late for them to go back to school, start a business, or pursue that unique interest of theirs. The truth of the matter is that we are never too old, it is just the story and timeline we have given ourselves. We have told ourselves that certain things need to happen by a certain age, or they will never happen for us. Nothing can be further from the truth, we can choose and make our destiny at any time. Here are some inspirational stories who understand that age is merely a number, and it is never too late to accomplish them dream. 1. At 40, Hank Aaron hit his 715th home run. This was not mere luck of years of playing. This was talent, developed through many hours and many years of practice. He had a passion for something, and he kept at it until he became at the top of his field. 2. At 49, Julia Child FINALLY published her book, “Mastering the French Art of Cooking.” Anyone familiar with the life and story of Julia Child’s know that she spent MANY years writing and re-writing, being rejected, looking for her place, and then FINALLY someone saw in her what had been there all along. Although it did not come until the second half of her life, she became one of the most beloved and respected chefs of our lifetime. 3. At Age 60, George Bernard Shaw finished writing, “Heartbreak House.” This was considered by many to be the greatest work of his career, but it took almost his entire career to come up with the right combination that resonated with people. Imagine working your whole life to finally come into your own? It was clearly possible. 4. At age 72, Margaret Ringenberg made a flight around the globe. While this may not be a common name, it is a very uncommon accomplishment. To have wanted something for so long, to have waited so many year, and to say I will not give up on this dream due to a simple matter of age. 5. At age 77, yes you heard this right 77, John Glenn became the oldest astronaut to ever go into space. Something about this just leaves me in awe. When I think of the training, the physicality, the mental abilities, and the sheer drive to do something in your lifetime, I am continually impressed that he was able to accomplish this. Something that many would never be able to do. 6. At age 86, Katherine Pelton swam the 200 meter butterfly (a stroke I struggle with period), in 1 minute and 14 seconds. Do the words astounding come to mind? Something that many of us could not achieve, something that many of us tell ourselves we cannot more importantly. She is living proof that we can accomplish great things with practice and perseverance. 7. At age 92, Paul Spangler finished his 14th marathon! One is an accomplishment, 14 a great feat for anyone, but for a 92-year-old man to be out there keeping up with the most elite, and those training, what is our excuse for not getting up and working out in the morning. It takes a little steam out of all the excuses, the snoozes, and the tomorrows. 8. Dorothy Davenhill Hirsch became the oldest person the North Pole aboard a Russian Nuclear ice breaker. Talk about refusing to leave something off the bucket list. That is amazing. Something many of us will never achieve in our lifetimes, she MADE happen. This is not to say we cannot make these things happen for ourselves, it is just that we choose not to. Look what choosing and perseverance get you! 9. Dr. Leila Denmark worked as a pediatrician until her chosen retirement at the age of 103. Talk about loving what you do. A perfect example of when you love what you do, it is not a chore, it is a joy. One that you want to do as long as you are able. I think we all hope to find a calling like that! 10. Talk about a lifelong goal realized! Bertha Wood, born in 1905, dreamed her whole life of writing and publishing a book. This dream was finally realized in 2005, and was based on her memoirs. I suppose there was a great deal to be said in the 90 years it took her to write it! So ask . . . and believe. And don’t doubt . . . ever. 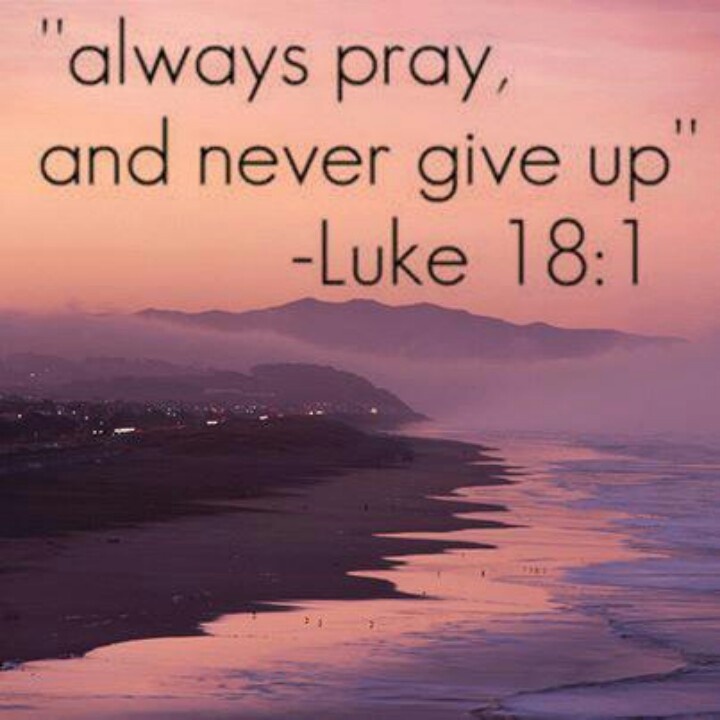 Right before Jesus told the parable about the persistent widow and the unjust judge in Luke 18:1-8, his very first words to his disciples were that they should always pray and not give up (verse 1). That goes for us today, too. So if you’re reading this, you’re not dead yet . . . 🙂 And if you’re not dead yet, you never know what the future holds regardless of your current circumstances, regardless of your age, and regardless of any other circumstances you want to use as an excuse. Trust God and pray. Now would be a good time! As the Apostle Paul wrote from a prison cell, “I can do all things through Christ who strengthens me” (Phillipians 4:13), so we, too, can do the same . . . . So always pray . . .
And never give up, never give up . . .
Never give up . . . .